Back in October of last year, I was honoured to attend a launch party for Paul John Single Cask Whisky from India. 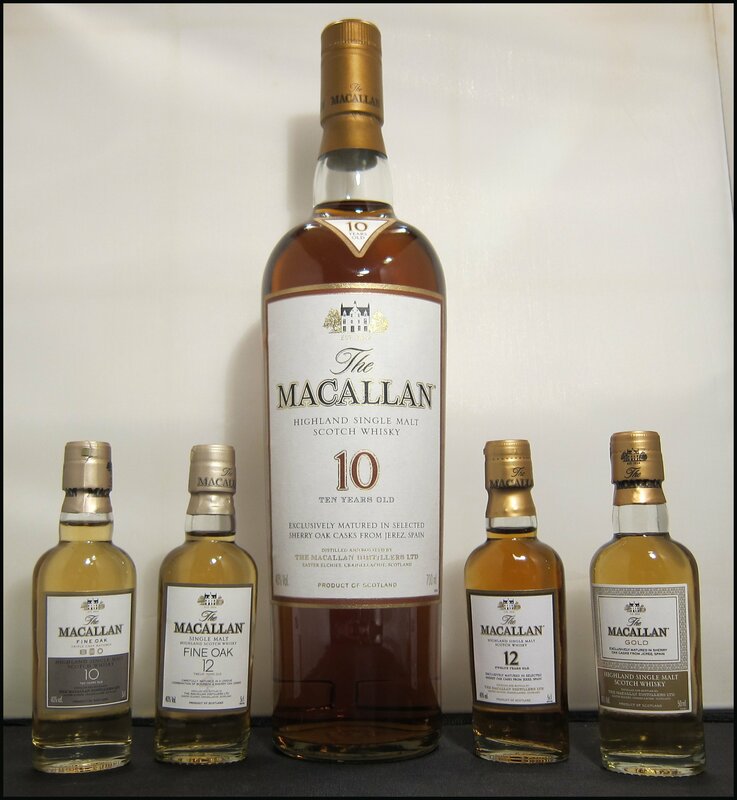 With positive reviews abound, the company set about continuing their plans to introduce the international markets to new whisky; the evidence being in the newest additions to their range: two single malts, entitled Brilliance and Edited. These two whiskies are set to be permanent bottlings for the Paul John Distillery. Both are distilled in Goa using copper-pot stills, are aged in ex-Bourbon barrels, and are bottled at 46% ABV. 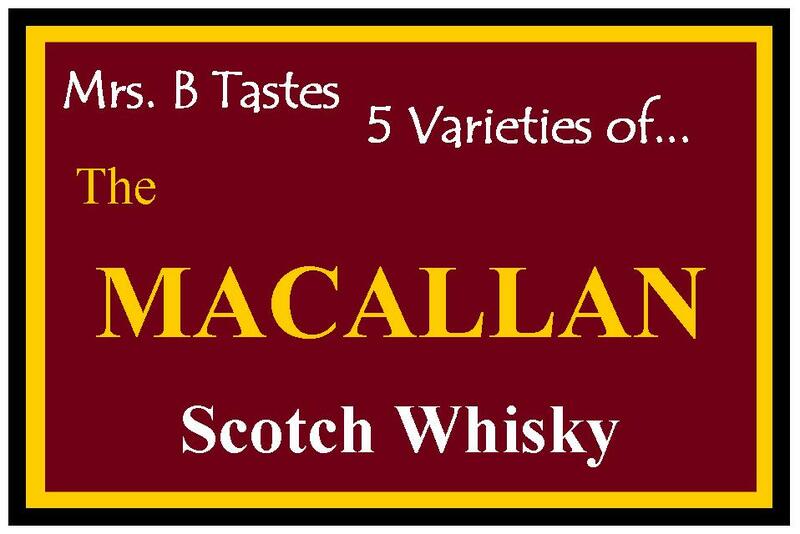 The primary difference between the two is that Brilliance is made from unpeated malted barley, whereas Edited is made from a combination of unpeated and peated malted barley. All of the barley is also from India and this, combined with the extreme climate (temperatures can reach over 40°C), makes these whiskies distinctive in more ways than one. Here’s what I thought. Nose: Soft and sweet, but there’s also something unusually refreshing and “bright” about this, reminding me strongly of a Mint Julep made with fresh mint and a really good Bourbon. There’s smooth vanilla and light wood, plus a hint of cocoa paste, a little coconut, papaya and pineapple, like you’d find in muesli (these notes are similar to some of those in the Single Cask). Taste: Quite powerful from the outset, with the same tropical flavours (dried pineapple, in particular) that I found on the nose coming through both on the palate and in the finish. In the middle, there are also some slightly bitter (but not in a bad way), raw wood notes that are accompanied by a strong warmth. Finish: Light tannins, a little bit of dried banana chips and vanilla. Nose: Very light smoke and faint hints of peat, along with wood varnish and liquorice allsorts. Despite the lightness of the smoke, this is a good, strong nose. After a little warming, I also got some notes of sweet spice and sherry. Taste: In contrast to Brilliance, this had more of a gradual, building warmth and spicy texture. It also seems sweeter and has more weight to it, with darker wood notes, liquorice and cinnamon. Finish: Roasted banana and cream, a tiny touch of sweet spice, including a hint of nutmeg, and vanilla. Both of these whiskies have unique, but different profiles. I loved being able to taste them without any expectations, because they seem both familiar – they have many of the quality wood notes that you’d recognise from Scotch whisky – and yet, at the same time, refreshingly different. I’m a big fan, in particular, of the bright, tropical notes of Brilliance, which are perfectly balanced by the warmth behind them. Then again, the light peat and liquorice notes within Edited also drew me in. The lovely finishes of both makes it exceptionally difficult for me to choose a favourite between the two, although I think Brilliance has it, very slightly. Unless you only like heavy, smoky whiskies, I’d definitely recommend trying these if you get the chance. 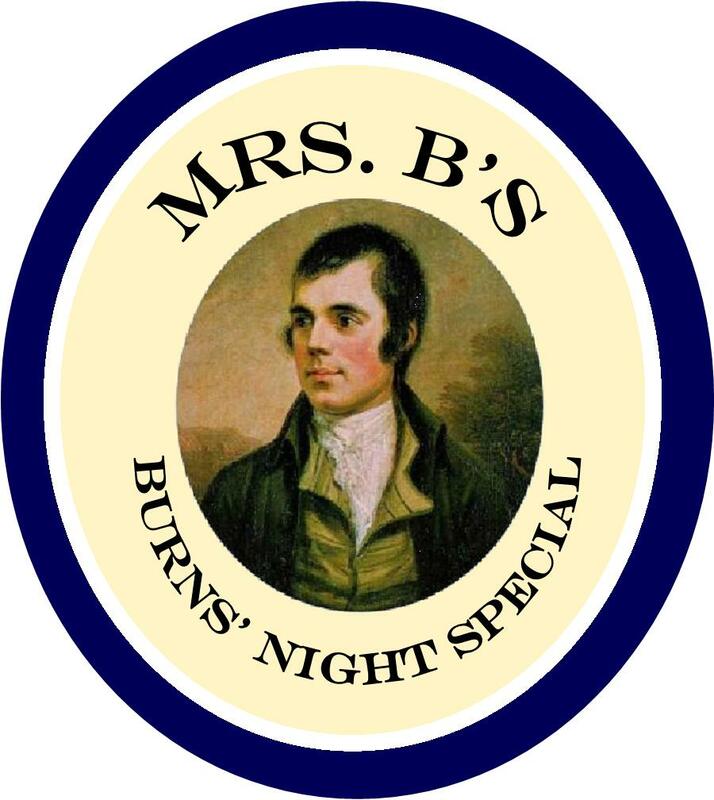 Mrs. B’s – Burn’s Night Special! Today, 25th January, is Robert Burns Day or Burns Night, a day to celebrate the life and works of Scottish poet Robert Burns. Burns Night celebrations can be exceptionally formal affairs, but ever since our honeymoon in Edinburgh, DTS & I have held a somewhat more informal dinner on Burns Night. 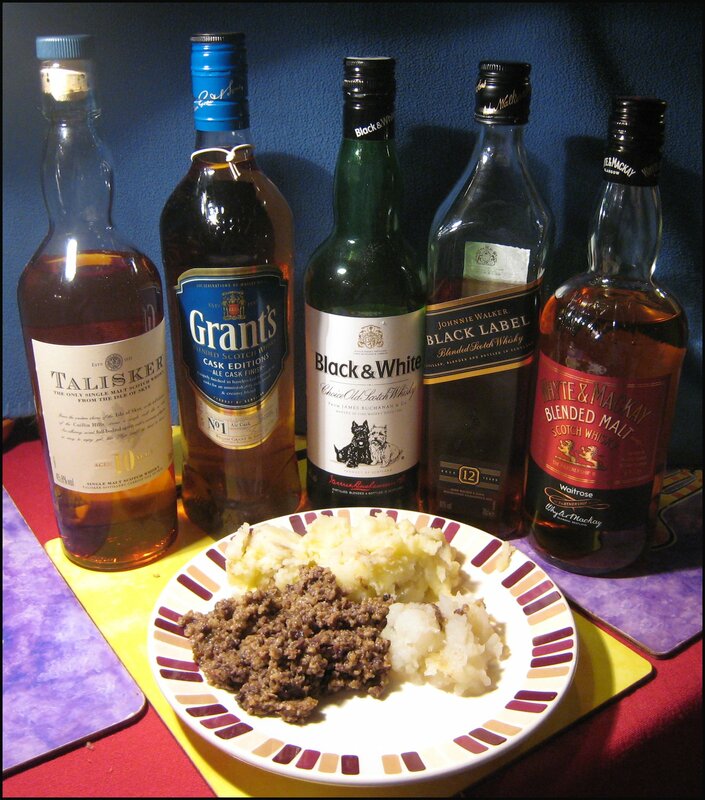 It involves haggis, neeps and tatties, and – without a doubt – some whisky. Rather than go in-depth into the history or ceremony behind Burns Night, I instead wanted to do a quick investigation of how a range of different whiskies (selected by the fact that they were readily available in our drinks cabinet) accompanied such a meal. Given the number that I was trying, and the speed at which my dinner was cooling down, my notes aren’t particularly extensive, but I was able to get a good idea of which fitted this particular bill best. The pepperiness and chilli kick of this whisky work incredibly well alongside the spices in haggis. The peatiness adds a little something special – another dimension to the flavours of the plate. A general excellent all-rounder alongside the meal; the flavour is good and woody, without being harsh or contrasting with the haggis. The spice of the meal somewhat masked most hints of the ale cask, but this still tasted pretty good. Beautiful and full of flavour with excellent peaty notes and deliciously smooth. However, this also had more hints of sweetness that I think would go better as an after-dinner tipple than one to accompany the meal itself. Sadly, I don’t think whisky is available any longer, although we found it to be a good standard Scotch – excellent value for money. When drunk alongside our Burns Night dinner, this was improved considerably by a drop or two of water, which opened it up, bringing out more subtle notes of wood and spice, allowing it to better complement the haggis. This had a stronger and more direct flavour than the others, which, even with water, seemed to distract a little from the meal. From personal experience, I know that this whisky works particularly well in a Whisky Ginger, so – next time – I think that would be the better way to enjoy B&W on Burns Night. My favourite whisky of those that I tried with my haggis, neeps & tatties was undoubtedly the Talisker, which had the perfect combination of power of flavour, spice and savouriness to best complement the meal. 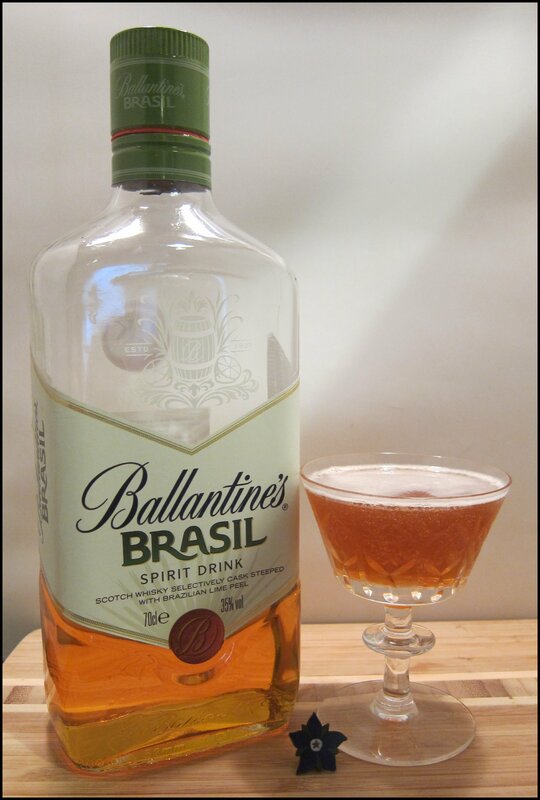 After dinner, DTS made me the following cocktail – a take on a Rusty Nail – was recommended to us by Jamie Stephenson, Drambuie Global Brand Ambassador. Nose: Bright and refreshing, with strong notes of orange fondant. 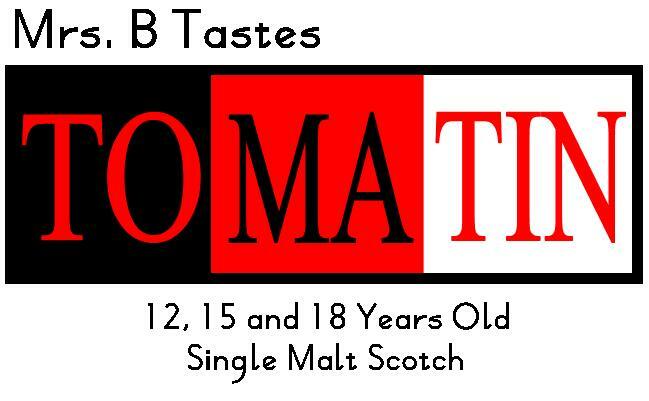 Taste: Lighter and more refreshing than Drambuie on its own in a Rusty Nail; this is drier, thinner, but still with a distinctive flavour. 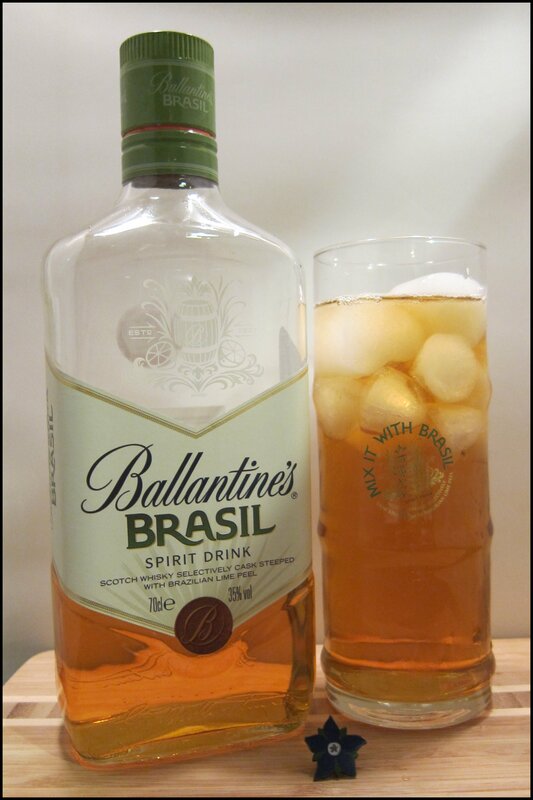 A delicious drink, especially if you generally find Drambuie a bit sweet on its own. 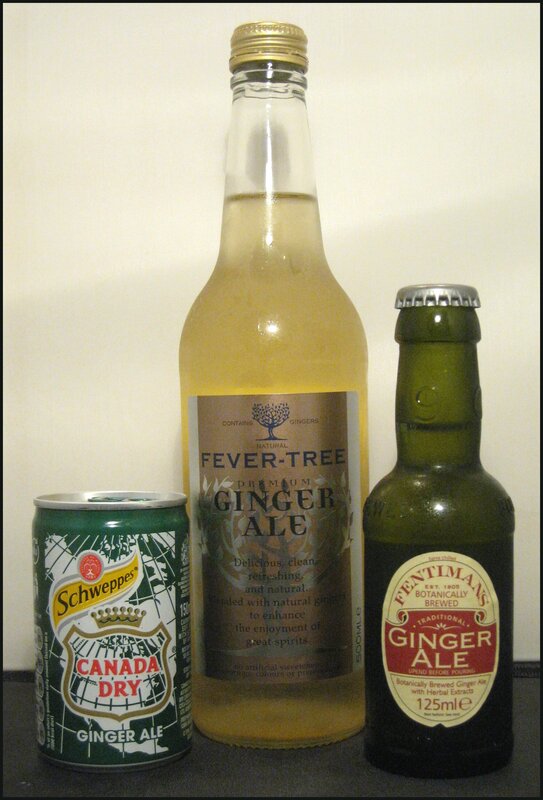 If you fancy a little extra sweetness, a piece of shortbread goes particularly well with this. 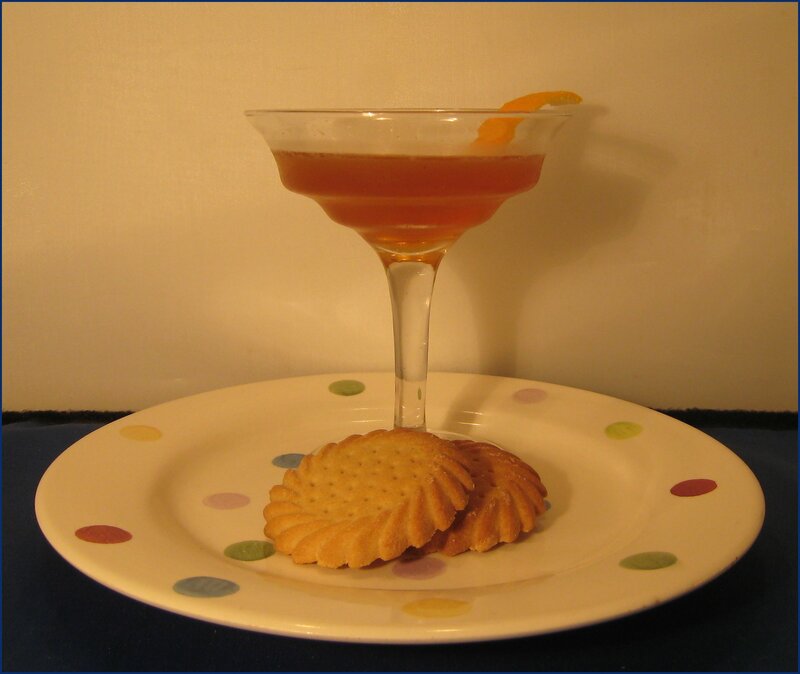 For those who fancy some gin to celebrate Burns Night with, I can recommend the Argyll Station Chief, which is a variation on the Berlin Station Chief*. Pour Scotch into an ice-filled cocktail shaker. After coating the ice with the whisky, strain the remainder into a small glass (to drink later, or give to your wife). Add the gin, shake and strain into a chilled cocktail glass. Strong gin flavours upfront: juniper, citrus and some herbal-floral notes, all followed by the dry, long, smoky finish of the whisky. This is strong (the gin is 50%ABV), but a good drink to have before you sit down to your Burns Night supper. Once again, it’s that wonderful time of year when shops may have leftover Christmas stock in the form of whisky miniatures – a fantastic way to explore different whiskies without spending a fortune. 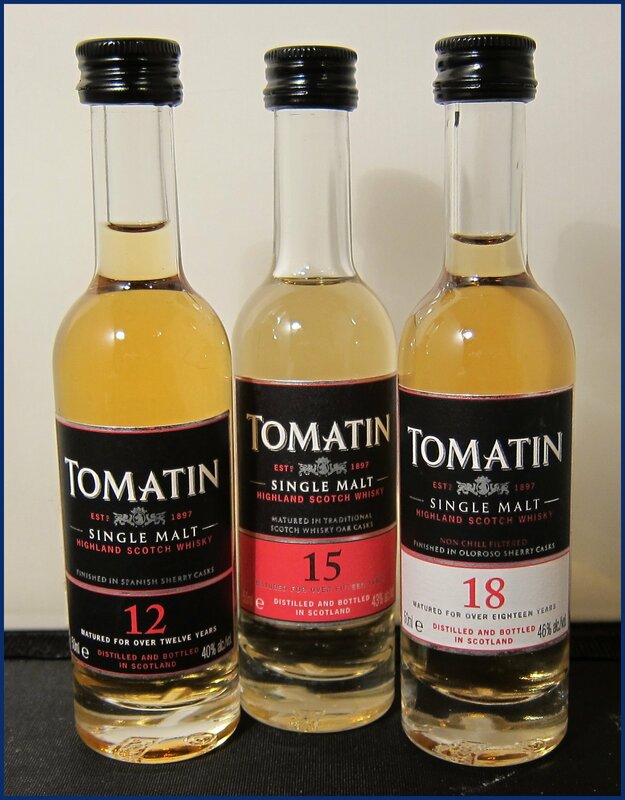 One of the sets that I received as a gift over the holidays was one containing three whiskies from the Tomatin Distillery, which is based on the edge of the Monadhliath Mountains, near Inverness, Scotland. The distillery site has history dating back to the 15th Century, but was formally set up in 1897. 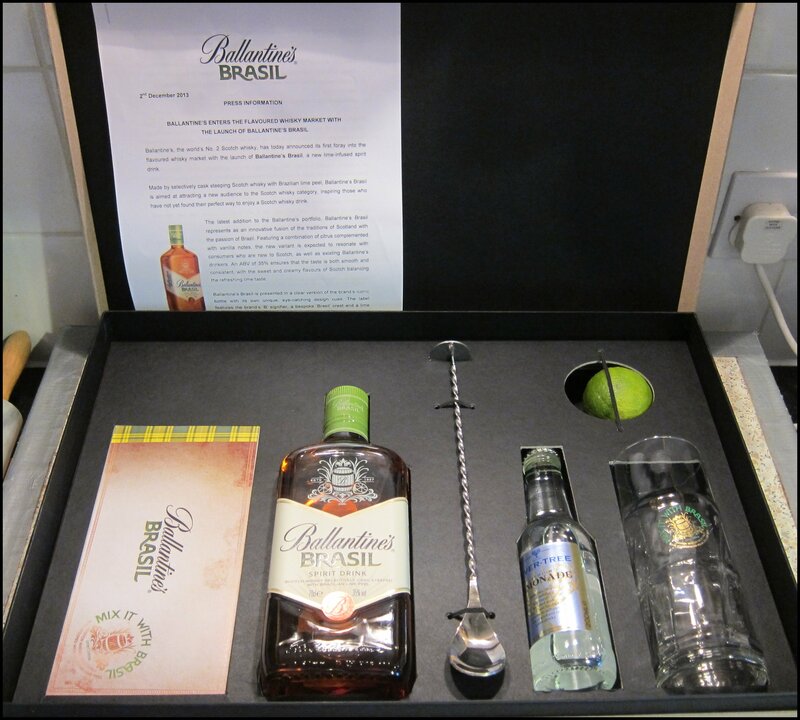 The gift set contains a 50ml bottle of each of their 12, 15 and 18 Year Old whiskies (which is quite a recent line-up, as the 15 Year Old was only introduced in 2009). This whisky was introduced in 2003 and has been aged in 1st or 2nd fill American Oak casks, before being finished in sherry butts (for a minimum of six months). Nose: Bread, yeast and oat cakes, with a little sea air and sherry, too. Mainly a surprisingly pleasant combination dough and oat cakes, though. Taste: Strong, savoury flavours from the outset; whilst its very smooth, even if you hold it in your mouth for a while, the flavours are potent and there’s a good warmth to it. The main flavours are of light wood and oat cakes, but there’s an intriguing, slightly bitter finish which is more vegetal. 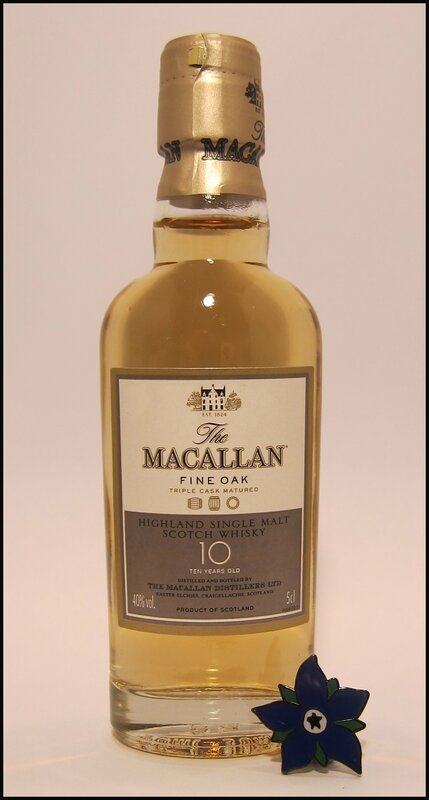 Introduced in 2009, the 15 Year Old has been aged in refill American Oak casks. Nose: Light and distinctly creamy (just a touch of salted caramel or toffee), with malt, barley and wisps of smoke. There’s a breadiness to the creaminess, but nothing heavy. Taste: Again, wisps of smoke amongst a backdrop of clean, white wood and light citrus (mainly orange, but with hints of lemon). The flavour is quite “raw” at points, but there’s no burn. The finish is quite heavy on notes of hops and malt, with hints of chocolate. Introduced in 2006, this whisky is non-chill filtered and aged in refill American Oak casks, before being finished in Spanish Oloroso sherry butts. Nose: Lighter, softer and sweeter, but also stronger on the alcohol. Again, I get notes of faint sea air and the kind of fresh, slightly tart, dry fruitiness that you would get from a dry sherry. It finishes with notes of oats. 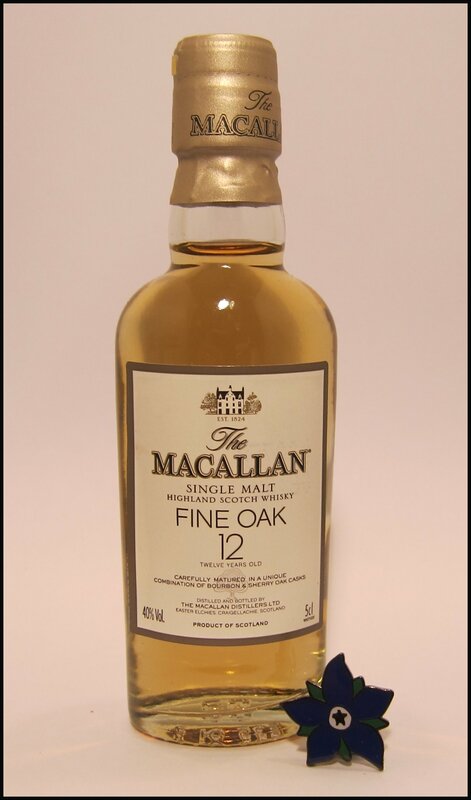 Taste: Savoury and fresh, with a toffee-like mouthfeel that follows an initial burst of savoury notes. This has a surprisingly short flavour, which is predominantly made up of tart, dry sherry notes, and a lighter, sweet woodiness with highlights of dried fruit towards the end. Whilst none of these whiskies were to my own personal tastes, I’m glad that I’ve tried the range and think that my Dad will be quite partial to the 15 Year Old, which was also my favourite of the three. This little gift set is an excellent, good-value way to try them (you can purchase it from The Whisky Exchange for around £17.25).